A lynx which is back in Dartmoor zoo after almost a month on the run is getting an incentive to stay put. Flaviu, a two-year-old Carpathian lynx, disappeared after chewing his way out of his enclosure - and was only recaptured after being lured into a humane trap. Now - plans are in place to find him a mate. He’s grumpy but we’re already trying to find him a female lynx to keep him company. Hopefully we can find him a mate and reproduce so we can continue the species. And he'll be looking his best when he meets his lady-love - the zoo says the weeks in the wild haven't done Flaviu any harm, and he weighs exactly the same as when he escaped. A lynx who escaped from Dartmoor zoo almost a month ago has finally been recaptured. Some people are claiming that the young lynx that has gone on the run from Dartmoor Zoo is missing its mother. They think that, once he is captured, he should be reunited with her at the zoo in Kent where they were based. The big cat gnawed his way out of his new enclosure in Devon within hours of his arrival last Wednesday, 7 July. The zoo is even using recordings of the mother, supplied by Port Lympne reserve to try to lure two-year-old Flaviu into a trap laid for him. Sam Crofts has started a petition saying this indicates that the youngster is missing his mum and should be reunited with her. Many of the zoo staff and volunteers helping to locate a missing lynx on Dartmoor have been told to stand down. It's because two-year-old Flaviu has been located on a section of farmland. Staff at the Dartmoor Zoo say it is now a case of watching and waiting. A number of humane traps have been set and it is hoped the wild cat will contain himself. Staff are now watching from a safe distance and hope he will be tempted by some tasty meat. A huge search operation was launched yesterday and the zoo remains shut. 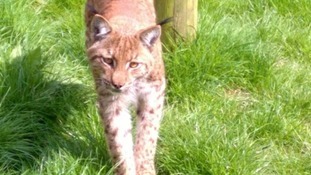 The search continues for an escaped lynx that has gone missing from Dartmoor Zoo. Police and staff have been searching through the night.